D.D. Kosambi, the Indian Marxist historian, once dismissed the Bhagavad Gita as “700 fratricidal verses.” And while this text has been extolled by champions of nonviolence such as Thoreau and Gandhi, Kosambi does have a point: Krishna – God himself who has taken on human form – urges Arjuna, the reluctant warrior, to fight in battle against his teachers, cousins, and friends. Why? Because his dharma requires him to do so. Arjuna must act in this battle in order to preserve the order of the universe, even if it means slaughtering his kin. Krishna’s teaching is, in many ways, a classic statement of deontological ethics: the moral thing is to do one’s duty, no matter the outcome. Kant gives a famous example when he describes the following situation: imagine that a friend comes to your door, seeking shelter. Someone is after her and is trying to kill her. Not long after, that same person arrives at your door, asking if your friend is inside. What do you do? For Kant, there was only one answer: tell the truth. Why? Because in Kant’s conception of morality, lying is never permitted. Individuals had a duty to tell the truth, and to act in such a way that they could wish that their actions be a universal principle. Kant did not think that we could ever permit exceptions to lying, and that is probably why he chose such a stark example to illustrate his philosophy and the categorical imperative. So too the Gita. 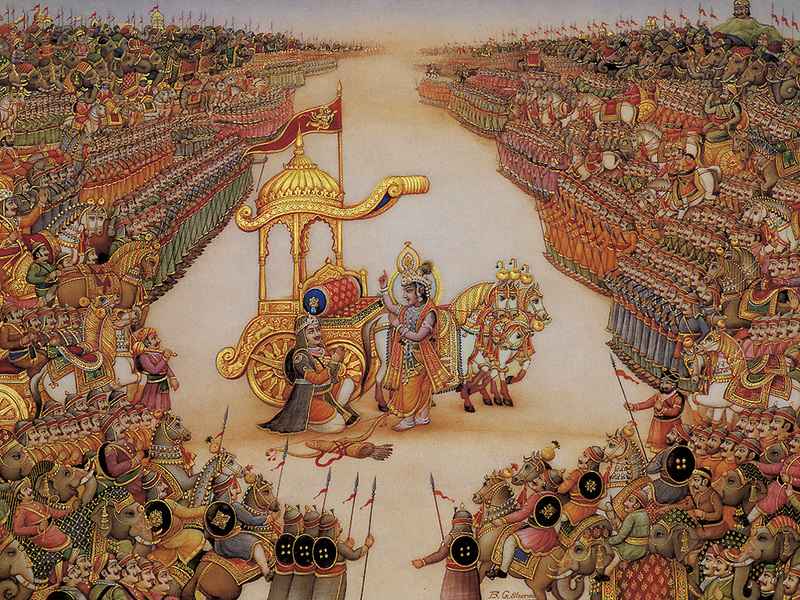 The first chapter of the Gita describes a great battle: the drums are being beaten, the conch shells are being blown, armies are arrayed across the battlefield from each other. Valiant warriors are described, many of whom possess magical weapons gifted by the gods. Arjuna, the greatest warrior of his day – and, it must be noted, someone who up until this point has never hesitated on the field of battle – suddenly pauses. He tells his charioteer, “I see omens of chaos [adharma],/ Krishna; I see no good/ in killing my kinsmen/ in battle” (1:31). Later, he continues, describing the individuals across the battlefield: “They are teachers, fathers, sons,/ and grandfathers, uncles, grandsons,/ fathers and brothers of wives,/ and other men of our family.// I do not want to kill them/ even if I am killed, Krishna” (1:34-5). Has Arjuna had a moment of spiritual insight, seeing the individuality and particularity of the people across the field of battle instead of viewing them as a nameless and faceless “enemy”? Has he made a spiritual leap forward, realizing the importance of non-violence in the moral life? No. Not to Krishna, at least. The first thing he does is call Arjuna a coward, asking him, “Why this cowardice/ in time of crisis, Arjuna?/ The coward is ignoble, shameful,/ foreign to the ways of heaven” (2:2). In the next verse Krishna goes so far as to question Arjuna’s manhood – his virility – telling him, “Don’t yield to impotence!/ It is unnatural in you! Banish this petty weakness from your heart. Rise to the fight, Arjuna!” (2:3). Our discussion of the Gita served as a backdrop for a Boston Globe article my students and I read recently about the nurses who cared for Dzhokhar Tsarnaev. After the horrific bombings in Boston last year, several nurses were called into work and told that they faced an almost-unimaginable task: they were to care for and nurse back to health Dzhokhar Tsarnaev, the only surviving brother of the alleged Boston Bombers. Krishna (and Kant, for that matter) would tell the nurses – and us – that such concerns are not a part of the business of living an ethical life. What matters is doing our dharma – performing with an appropriate motivation the duties that we must do to ensure that society functions well. These nurses, in an inconceivably difficult situation, did just that. They cared for the patient in front of them, because that’s what their duty was. In doing so, they exemplified the teachings of the Gita and gave a powerful illustration of what it means to live a moral life bound by duty: we don’t get to pick our patients any more than Arjuna got to pick who was on the other side of the battlefield. This entry was posted in Hinduism and tagged Arjuna, Bhagavad Gita, deontological ethics, dzhokhar tsarnaev, ethics, Hinduism, kant, Krishna, religion, teaching by teachingasianreligions. Bookmark the permalink.